The massacres of Poles in Volhynia and Eastern Galicia (Polish: rzeź wołyńska, literally: Volhynian slaughter; Ukrainian: Волинська трагедія, Volyn tragedy), was an ethnic cleansing and genocide carried out in Nazi German-occupied Poland by the Ukrainian Insurgent Army (the UPA) against Poles in the area of Volhynia, Eastern Galicia, parts of Polesia and Lublin region, beginning in 1943 and lasting up to 1945. The peak of the massacres took place in July and August 1943. Most of the victims were women and children. UPA's methods were particularly brutal, with many of the victims being tortured and mutilated, and resulted in 40,000–60,000 Polish deaths in Volhynia and 30,000–40,000 in Eastern Galicia, with the other regions for the total about 100,000. The killings were directly linked with the policies of the Bandera faction of the Organization of Ukrainian Nationalists (OUN-B) and its military arm, the Ukrainian Insurgent Army, whose goal as specified at the Second Conference of the OUN-B on 17–23 February 1943 (or March 1943 according to other sources) was to purge all non-Ukrainians from the future Ukrainian state. Not limiting their activities to the purging of Polish civilians, the UPA also wanted to erase all traces of the Polish presence in the area. The violence was endorsed by a significant number of the Ukrainian Orthodox clergy who supported UPA's nationalist cause. The massacres led to a wider conflict between Polish and Ukrainian forces in the German-occupied territories, with the Polish Home Army in Volhynia responding to the Ukrainian attacks. In 2008, the massacres committed by the Ukrainian nationalists against the Poles in Volhynia and Galicia were described by Poland's Institute of National Remembrance as bearing the distinct characteristics of a genocide, and on 22 July 2016 Poland's parliament passed a resolution recognizing the massacres as genocide. Original map showing the distribution of native languages spoken within Poland at the time of the 1931 census. Just before the Soviet invasion of 1939, Volhynia was part of the Second Polish Republic. According to Yale historian Timothy Snyder, between 1928 and 1938, Volhynia was "the site of one of eastern Europe's most ambitious policies of toleration". Through supporting Ukrainian culture, religious autonomy, and Ukrainization of the Orthodox church, Piłsudski and his allies wanted to achieve Ukrainian loyalty to the Polish state and to minimize Soviet influences in the borderline region. This approach was gradually abandoned after Piłsudski's death in 1935, as a consequence of increased radical Ukrainian nationalism. In 1929, Organization of Ukrainian Nationalists (OUN) formed in Vienna, Austria. OUN was the result of a union between radical nationalist and extreme right-wing organizations including the Union of Ukrainian Fascists. The organization initiated a terrorist campaign in Poland, which included the assassination of prominent Polish politicians such as Interior Minister Bronisław Pieracki, and Polish and Ukrainian moderates such as Tadeusz Hołówko. The terror campaign and civil unrest in the Galician countryside resulted in Polish police exacting a policy of collective responsibility on local Ukrainians in an effort to "pacify" the region; demolishing Ukrainian community centers and libraries, confiscating property and produce, and beating protesters. Ukrainian parliamentarians were placed under house arrest to prevent them from participating in elections, with their constituents terrorized into voting for Polish candidates. The Ukrainian plight, protests, and pacification received the attention of the League of Nations as 'an international cause célèbre'; with Poland receiving condemnation from European politicians. The ongoing policies of the Polish state led to the deepening of ethnic cleavages in the area. Volhynia was a place of increasingly violent conflict, with Polish police on one side and West Ukrainian communists supported by many dissatisfied Ukrainian peasants on the other. The communists organized strikes, killed at least 31 suspected police informers in 1935–1936 and began to assassinate local Ukrainian officials for "collaboration" with the Polish state. The police conducted mass arrests, reported killing 18 communists in 1935, and killed at least 31 people in gunfights and during arrest actions over the course of 1936. Beginning in 1937, the Polish government in Volhynia initiated an active campaign to use religion as a tool for Polonization and to convert the Orthodox population to Roman Catholicism. Over 190 Orthodox churches were destroyed and 150 converted to Roman Catholic churches. Remaining Orthodox churches were forced to use the Polish language in their sermons. In August 1939, the last remaining Orthodox church in the Volhynian capital of Lutsk was converted to a Roman Catholic church by decree of the Polish government. Between 1921 and 1938, thousands of Polish colonists and war veterans were encouraged to settle in the Volhynian and Galician country sides, adding to the already significant Polish, Jewish, German and Armenian urban populations in the two regions, whose presence in the lands dated back to the 14th century. The new settlements were constructed in areas lacking infrastructure with no buildings, roads and no rail connections. In spite of great difficulties, their number reached 17,700 in Volhynia in 3,500 new settlements by 1939. According to the Polish census of 1931, in Eastern Galicia the Ukrainian language was spoken by 52% of the inhabitants, Polish by 40% and Yiddish by 7%, In Wołyn (Volhynia), the Ukrainian language was spoken by 68% of the inhabitants, Polish by 17%, Yiddish by 10%, German by 2%, Czech by 2% and Russian by 1%. The additional presence of the newly arrived settlers ignited further anti-Polish sentiment among the local Ukrainians. Harsh policies implemented by the Second Polish Republic, while often provoked by OUN-B violence, contributed to a further deterioration of relations between the two ethnic groups. Between 1934 and 1938, a series of violent and sometimes deadly attacks against Ukrainians were conducted in other parts of Poland. Jeffrey Burds of Northeastern University believes that the buildup towards the ethnic cleansing of Poles that erupted during the Second World War in Galicia and Volhynia had its roots in this period. The Ukrainian population was outraged by the Polish government policies. A Polish report about the popular mood in Volhynia recorded a comment of a young Ukrainian from October 1938 as "we will decorate our pillars with you and our trees with your wives." By the beginning of World War II, the membership of OUN had risen to 20,000 active members and there were many times that number of supporters. In September 1939, at the outbreak of World War II and in accordance with the secret protocol of the Molotov–Ribbentrop Pact, Poland was invaded from the west by Nazi Germany and from the east by the Soviet Union. Volhynia was split by the Soviets into two oblasts, Rovno and Volyn of the Ukrainian SSR. Upon the annexation, the Soviet NKVD started to eliminate the predominantly Polish middle and upper classes, including social activists and military leaders. Between 1939–1941, 200,000 Poles were deported to Siberia by the Soviet authorities. Many Polish prisoners of war were deported to the East Ukraine where most of them were executed in basements of the Kharkiv NKVD offices. Estimates of the number of Polish citizens transferred to the Eastern European part of the USSR, the Urals, and Siberia range from 1.2 to 1.7 million. Tens of thousands of Poles fled from the Soviet-occupied zone to areas controlled by the Germans. The deportations and murders deprived the Poles of their community leaders. On June 22, 1941, the territories of eastern Poland occupied by the Soviet Union were attacked by German, Slovak, and Hungarian forces. The Red Army in Volhynia was able to resist only for a couple of days. On June 30, 1941 the Soviets withdrew eastward and Volhynia was overrun by the Nazis, with support from Ukrainian nationalists carrying out acts of sabotage. The OUN organized the Ukrainian People's Militia, which staged pogroms and assisted the Germans with roundups and executions of Poles, Jews, and those deemed as communist or Soviet activists, most notably in the city of Lwów, Stanisławów, Korosten and Sokal among other locations. During the first year of German occupation, OUN urged its members to join German police units. As police, they were trained in the use of weapons and as a result they could assist the German SS in murdering approximately 200,000 Volhynian Jews. 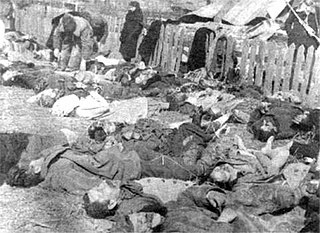 While the Ukrainian police's share in the actual killings of Jews was small (they primarily played a supporting role), the Ukrainian police learned genocidal techniques from the Germans i.e., detailed advanced planning and careful site selection; the use of phony assurances to the local populace prior to annihilation; sudden encirclement; and mass killing. This training from 1942 explains the UPA's efficiency in the killing of Poles in 1943. The decisions leading to the massacre of Poles in Volhynia and their implementation can be primarily attributed to the extremist Bandera faction of OUN (OUN-B) and not to other Ukrainian political or military groups. The OUN-B's ideology involved the following ideas: integral nationalism, that a pure national state and language were desired goals; glorification of violence and armed struggle of nation versus nation; and totalitarianism, in which the nation must be ruled by one person and one political party. While the moderate Melnyk faction of OUN admired aspects of Mussolini's fascism, the more extreme Bandera faction of OUN admired aspects of Nazism. At the time of OUN's founding, the most popular political party among Ukrainians was the Ukrainian National Democratic Alliance which, while opposed to Polish rule, called for peaceful and democratic means to achieve independence from Poland. The OUN, on the other hand, was originally a fringe movement within western Ukraine, condemned for its violence by figures from mainstream Ukrainian society such as the head of the Ukrainian Greek Catholic Church, Metropolitan Andriy Sheptytsky, who wrote of the OUN's leadership that "whoever demoralizes our youth is a criminal and an enemy of our people." Several factors contributed to OUN-B's increase in popularity and, ultimately, monopoly of power within Ukrainian society, conditions necessary for the massacres to occur. Only one group of Ukrainian nationalists, OUN-B under Mykola Lebed and then Roman Shukhevych, intended to ethnically cleanse Volhynia of Poles. Taras Bulba-Borovets, the founder of the Ukrainian People's Revolutionary Army, rejected this idea and condemned the anti-Polish massacres when they started. The OUN-M leadership didn't believe that such an operation was advantageous in 1943. After Hitler's attack on the Soviet Union, both the Polish Government in Exile and the Ukrainian OUN-B considered the possibility that in the event of mutually exhaustive attrition warfare between Germany and the Soviet Union, the region would become a scene of conflict between Poles and Ukrainians. The Polish Government in Exile, which wanted the region returned to Poland, planned for a swift armed takeover of the territory as part of its overall plan for a future anti-Nazi uprising. This view was compounded by OUN's prior collaboration with the Nazis, that by 1943 no understanding between the Polish government's Home Army and OUN was possible. In Eastern Galicia, the antagonism between Poles and Ukrainians intensified under the German occupation. Due to perceived Ukrainian collaboration with the Soviet government in 1939–1941 and with the later German administration, the general consensus among local Poles was that Ukrainians ought to be removed from these territories. In July 1942 a memorandum by the staff of the Home Army in Lviv in July 1942 recommended that between 1 million and 1.5 million Ukrainians be deported from Galicia and Volhynia to the Soviet Union and the rest scattered throughout Poland. Suggestions of a limited Ukrainian autonomy, as was being discussed by the Home Army in Warsaw and the Polish Exile Government in London, would find no support among the local Polish population. At the beginning of 1943, the Polish underground came to contemplate the possibility of rapprochement with Ukrainians. This proved fruitless as neither side was willing to retreat from its claim to Lviv. Even before the war, OUN adhered to concepts of integral nationalism in its totalistic form, according to which Ukrainian statehood required ethnic homogeneity and the Polish enemy could be defeated only by the elimination of Poles from Ukrainian territories. From OUN-B perspective, the Jewish population had already been annihilated, Russians and Germans were only temporarily in Ukraine, but Poles had to be forcefully removed. The OUN-B came to believe that it had to move fast while the Germans still controlled the area in order to preempt future Polish efforts at re-establishing Poland's pre-war borders. The result was that the local OUN-B commanders in Volhynia and Galicia (if not the OUN-B leadership itself) decided that an ethnic cleansing of Poles from the area, through terror and murder, was necessary. As evidenced by both Polish and Ukrainian underground reports, initially, the only major concern of Ukrainian nationalists was that of strong Soviet partisan groups operating in the area. The groups consisted mostly of Soviet POWs and initially specialized in raiding local settlements, which disturbed both the OUN and local Polish self-defense units, who expected it to result in an increase in German terror. These concerns soon materialized as Germans began "pacifying" entire villages in Volhynia in retaliation for real or alleged support for the Soviet partisans. Polish historiography attributed most of these actions to Ukrainian nationalists, while in reality they were conducted by Ukrainian auxiliary police units under the direct supervision of Germans. One of the best-known examples was the pacification of Obórki village in Lutsk county on November 13–14, 1942. While most of the actions were carried out by the Ukrainian occupational police, the murder of 53 Polish villagers was perpetrated personally by the Germans, who supervised the operation. For many months in 1942, the OUN-B was not able to control the situation in Volhynia, where in addition to Soviet partisans, many independent Ukrainian self-defense groups started to form in response to the growth of German terror. The first OUN-B military groups were created in Volhynia in autumn 1942 with the goal of subduing the other independent groups. By February 1943, OUN had initiated a policy of murdering civilian Poles as a way of resolving the Polish question in Ukraine. In spring 1943, OUN-B partisans started to call themselves the Ukrainian Insurgent Army (UPA), using the former name of the Ukrainian People's Revolutionary Army, another Ukrainian group operating in the area in 1942. In March 1943 approximately 5,000 Ukrainian policemen defected with their weapons and joined the UPA. Well-trained and well-armed, this group contributed to the UPA achieving dominance over other Ukrainian groups active in Volhynia. Soon, the newly created OUN-B forces managed to either destroy or absorb other Ukrainian groups in Volhynia, including four OUN-M units and the Ukrainian People's Revolutionary Army. According to Timothy Snyder, along the way Bandera-faction partisans killed tens of thousands of Ukrainians for supposed links to Melnyk or Bulba-Borovets. The OUN-B undertook steps to liquidate "foreign elements", with posters and leaflets urging Ukrainians to murder Poles. Its dominance secured (in spring 1943, the UPA gained control over the Volhynian countryside from the Germans), the UPA began large-scale operations against the Polish population. On February 9, 1943, a UPA group commanded by Hryhory Perehyniak pretending to be Soviet partisans assaulted the Parośle settlement in Sarny county. It is considered a prelude to the massacres, and is recognized as the first mass murder committed by the UPA in the area. Estimates of the number of victims range from 149 to 173. In 1943, the massacres were organized westwards, starting in March in Kostopol and Sarny counties. In April they moved to the area of Krzemieniec, Rivne, Dubno and Lutsk. The UPA killed approximately 7,000 unarmed men, women and children in late March and early April 1943. On the night of April 22–23, Ukrainian groups, commanded by Ivan Lytwynchuk (aka Dubovy), attacked the settlement of Janowa Dolina, killing 600 people and burning down the entire village. Those few who survived were mostly people that found refuge with friendly Ukrainian families. [better source needed] In one of the massacres, in the village of Lipniki, almost the entire family of Mirosław Hermaszewski (Poland's only astronaut) was murdered along with about 180 inhabitants. The attackers murdered the grandparents of composer Krzesimir Dębski, whose parents engaged during the Ukrainian attack on Kisielin. Dębski's parents survived, taking refuge with a friendly Ukrainian family. In another massacre, according to the UPA reports, the Polish colonies of Kuty, in the Szumski region, and Nowa Nowica, in the Webski region, were liquidated for cooperation with the Gestapo and German authorities." According to Polish sources, the Kuty self-defense unit managed to repel a UPA assault, though at least 53 Poles were murdered. The rest of the inhabitants decided to abandon the village and were escorted by the Germans who arrived at Kuty, alerted by the glow of fire and the sound of gunfire. Maksym Skorupskyi, one of the UPA commanders, wrote in his diary: "Starting from our action on Kuty, day by day after sunset, the sky was bathing in the glow of conflagration. Polish villages were burning." Despite this, most of the victims were women and children. In mid-1943, after a wave of killings of Polish civilians, the Poles tried to initiate negotiations with the UPA. Two delegates of the Polish government in Exile and AK, Zygmunt Rumel and Krzysztof Markiewicz attempted to negotiate with the UPA leaders, but were captured and murdered on July 10, 1943, in the village of Kustycze. Some sources claim they were tortured before their death. The following day, July 11, 1943, is regarded as the bloodiest day of the massacres, with many reports of UPA units marching from village to village, killing Polish civilians. On that day, UPA units surrounded and attacked Polish villages and settlements located in three counties – Kowel, Horochow, and Włodzimierz Wołyński. Events began at 3:00 am, leaving the Poles with little chance to escape. After the massacres, the Polish villages were burned to the ground. According to those few who survived, the action had been carefully prepared; a few days before the massacres there had been several meetings in Ukrainian villages, during which UPA members told the villagers that the slaughter of all Poles was necessary. Altogether, on July 11, 1943, the Ukrainians attacked 167 towns and villages. Within a few days an unspecified number of Polish villages were completely destroyed and their populations murdered. In the Polish village of Gurow, out of 480 inhabitants, only 70 survived; in the settlement of Orzeszyn, the UPA killed 306 out of 340 Poles; in the village of Sadowa out of 600 Polish inhabitants only 20 survived; in Zagaje out of 350 Poles only a few survived. This wave of massacres lasted 5 days, until July 16. the UPA continued the ethnic cleansing, particularly in rural areas, until most Poles had been deported, killed or expelled. These actions were conducted by many units, and were well-coordinated and thoroughly planned. In August 1943, the Polish village of Gaj (near Kovel) was burned and some 600 people massacred, in the village of Wola Ostrowiecka 529 people were killed, including 220 children under 14, and 438 people were killed, including 246 children, in Ostrowki. In September 1992 exhumations were carried out in these villages, confirming the number of dead. In the same month, the UPA placed notices in every Polish village stating "in 48 hours leave beyond the Bug River or the San river- otherwise Death." Ukrainian attackers limited their actions to villages and settlements, and did not strike towns or cities. The killings were opposed by the Ukrainian Central Committee under Volodymyr Kubiyovych. In response, UPA units murdered Ukrainian Central Committee representatives, and murdered a Ukrainian Catholic priest who had read an appeal by the Ukrainian Central Committee from his pulpit. Polish historian Władysław Filar, who witnessed the massacres, cites numerous statements made by Ukrainian officers when reporting their actions to the leaders of the UPA-OUN. For example, in late September 1943, the commandant "Lysyi" wrote to the OUN headquarters: "On September 29, 1943, I carried out the action in the villages of Wola Ostrowiecka (see Massacre of Wola Ostrowiecka), and Ostrivky (see Massacre of Ostrówki). I have liquidated all Poles, starting from the youngest ones. Afterwards, all buildings were burned and all goods were confiscated". On that day in Wola Ostrowiecka, 529 Poles were murdered (including 220 children under 14), and in Ostrówki, the Ukrainians killed 438 people (including 246 children). In late 1943 and early 1944, after most Poles in Volhynia had either been murdered or had fled the area, the conflict spread to the neighboring province of Galicia, where the majority of the population was still Ukrainian, but where the Polish presence was strong. Unlike in the case of Volhynia, where Polish villages were usually destroyed and their inhabitants murdered without warning, in east Galicia Poles were sometimes given the choice of fleeing or being killed. An order by a UPA commander in Galicia stated, "Once more I remind you: first call upon Poles to abandon their land and only later liquidate them, not the other way around"). This change in tactics, combined with better Polish self-defense and a demographic balance more favorable to Poles, resulted in a significantly lower death toll among Poles in Galicia than in Volhynia. The methods used by Ukrainian nationalists in this area were the same, and consisted of rounding up and killing all the Polish residents of the villages, then looting the villages and burning them to the ground. On February 28, 1944, in the village of Korosciatyn 135 Poles were murdered; the victims were later counted by a local Roman Catholic priest, Rev. Mieczysław Kamiński. Jan Zaleski (father of Fr. Tadeusz Isakowicz-Zaleski) who witnessed the massacre, wrote in his diary: "The slaughter lasted almost all night. We heard terrible cries, the roar of cattle burning alive, shooting. It seemed that Antichrist himself began his activity!" Father Kamiński claimed that in Koropiec, where no Poles were actually murdered, a local Greek Catholic priest, in reference to mixed Polish-Ukrainian families, proclaimed from the pulpit: "Mother, you're suckling an enemy – strangle it." Among the scores of Polish villages whose inhabitants were murdered and all buildings burned, there are such places as Berezowica near Zbaraz, Ihrowica near Ternopil, Plotych near Ternopil, Podkamien near Brody, and Hanachiv and Hanachivka near Przemyślany. Roman Shukhevych, a UPA commander, stated in his order from 25 February 1944: "In view of the success of the Soviet forces it is necessary to speed up the liquidation of the Poles, they must be totally wiped out, their villages burned ... only the Polish population must be destroyed." One of the most infamous massacres took place on February 28, 1944, in the Polish village of Huta Pieniacka, with over 1,000 inhabitants. The village served as a shelter for refugees including Polish Jews, as well as a recuperation base for Polish and Communist partisans. One AK unit was active there. In the winter of 1944, a Soviet partisan unit numbering 1,000 was stationed in the village for two weeks. Huta Pieniacka's villagers, although poor, organized a well-fortified and armed self-defense unit that fought off a Ukrainian and German reconnaissance attack on February 23, 1944. [unreliable source?] Two soldiers of the 14th Waffen Grenadier Division of the SS Galicia (1st Ukrainian) Division of the Waffen-SS were killed and one wounded by the villagers. On February 28, elements of the Ukrainian 14th SS Division from Brody returned with 500–600 men, assisted by a group of civilian nationalists. The killing spree lasted all day. Kazimierz Wojciechowski, the commander of the Polish self-defense unit, was drenched with gasoline and burned alive at the main square. The village was utterly destroyed and all of its occupants killed. The civilians, mostly women and children, were rounded up at a church, divided and locked in barns which were set on fire. Estimates of casualties in the Huta Pieniacka massacre vary, and include 500 (Ukrainian archives), over 1,000 (Tadeusz Piotrowski), and 1,200 (Sol Littman). According to IPN investigation, the crime was committed by the 4th battalion of the Ukrainian 14th SS Division supported by UPA units and local Ukrainian civilians. A military journal of the Ukrainian 14th SS Division condemned the killing of Poles. In a March 2, 1944, article directed to the Ukrainian youth, written by military leaders, Soviet partisans were blamed for the murders of Poles and Ukrainians, and the authors stated that "If God forbid, among those who committed such inhuman acts, a Ukrainian hand was found, it will be forever excluded from the Ukrainian national community." Some historians deny the role of the Ukrainian 14th SS Division in the killings, and attribute them entirely to German units, while others disagree. [verification needed] According to Yale historian Timothy Snyder, the Ukrainian 14th SS Division's role in the ethnic cleansing of Poles from western Ukraine was marginal. The village of Pidkamin (Podkamień) near Brody was a shelter for Poles, who hid in the monastery of the Dominicans there. Some 2,000 persons, the majority of them women and children, were living there when the monastery was attacked in mid-March 1944 by the UPA units, which according to Polish Home Army accounts were cooperating with the Ukrainian SS. Over 250 Poles were killed. In the nearby village of Palikrovy, 300 Poles were killed, 20 in Maliniska and 16 in Chernytsia. Armed Ukrainian groups destroyed the monastery, stealing all valuables. What remained was the painting of Mary of Pidkamin, which now is kept in St. Wojciech Church in Wrocław. According to Kirichuk, the first attacks on the Poles took place there in August 1943 and they were probably the work of the UPA units from Volhynia. In retaliation, Poles killed important Ukrainians, including the Ukrainian doctor Lastowiecky from Lviv and a popular football player from Przemyśl, Wowczyszyn. By the end of the summer, mass acts of terror aimed at Poles were taking place in Eastern Galicia with the purpose of forcing Poles to settle on the western bank of the San River, under the slogan "Poles behind the San". Snyder estimates that 25,000 Poles were killed in Galicia alone, Grzegorz Motyka estimated the number of victims at 30,000–40,000. By Autumn 1944, anti-Polish actions stopped and terror was only used against those who cooperated with the NKVD, but in late 1944-early 1945, the UPA performed a last massive anti-Polish action in Ternopil region. On the night of February 5–6, 1945, Ukrainian groups attacked the Polish village of Barysz, near Buchach: 126 Poles were massacred, including women and children. A few days later on February 12–13, a local group of OUN under Petro Khamchuk attacked the Polish settlement of Puźniki, killing around 100 people and burning houses. Those who survived moved mostly to Niemysłowice, Gmina Prudnik. Approximately 150-366 Ukrainian and a few Polish inhabitants of Pawłokoma were killed on March 3, 1945 by a former Polish Home Army unit aided by Polish self-defense groups from nearby villages. The massacre is believed to be an act of retaliation for earlier alleged murders by Ukrainian Insurgent Army of nine (or 11) Poles in Pawłokoma and unspecified number of Poles killed by of the UPA in neighboring villages. UPA commander's order of 6 April 1944 stated: "Fight them [the Poles] unmercifully. No one is to be spared, even in case of mixed marriages"
According to Polish historian Piotr Łossowski, the method used in most of the attacks was the same. At first, local Poles were assured that nothing would happen to them. Then, at dawn, a village was surrounded by armed members of the UPA, behind whom were peasants with axes, hammers, knives, and saws. All the Poles encountered were murdered; sometimes they were herded into one spot, to make it easier. After a massacre, all goods were looted, including clothes, grain, and furniture. The final part of an attack was setting fire to the village. In many cases, victims were tortured and their bodies mutilated. All vestiges of Polish existence were eradicated, with even abandoned Polish settlements burned to the ground. Even though it may be an exaggeration to say that the massacres enjoyed general support of the Ukrainians, it has been suggested that without wide support from local Ukrainians they would have been impossible. Those Ukrainian peasants who took part in the killings created their own groups called SKV or Samoboronni Kushtchovi Viddily (Самооборонні Кущові Відділи, СКВ). Many of their victims perceived as Poles even without the knowledge of the Polish language, were murdered by СКВ along with the others. Ukrainians in ethnically mixed settlements were offered material incentives to join in the slaughter of their neighbours, or warned by UPA's security service (Sluzhba Bezbeky) to flee by night, while all remaining inhabitants were murdered at dawn. Many Ukrainians risked, and in some cases, lost their lives trying to shelter or warn Poles – such activities were treated by of the UPA as collaboration with the enemy and severely punished. In 2007, the Polish Institute of National Remembrance (IPN) published a document Kresowa Ksiega Sprawiedliwych 1939 – 1945. O Ukraincach ratujacych Polakow poddanych eksterminacji przez OUN i UPA ("Borderland's Book of the Righteous. About Ukrainians saving Poles from extermination of OUN and UIA"). The author of the book, IPN's historian Romuald Niedzielko, documented 1341 cases in which Ukrainian civilians helped their Polish neighbors. For this, 384 Ukrainians were executed by of the UPA. In case of Polish-Ukrainian families, one common UPA instruction was to kill one's Polish spouse and children born of that marriage. People who refused to carry such an order were often murdered together with their entire family. According to Ukrainian sources, in October 1943, the Volhynian delegation of the Polish government estimated the number of Polish casualties in the counties of Sarny, Kostopol, Równe, and Zdołbunów, to exceed 15,000 people. Timothy Snyder estimates that in July 1943, the UPA actions resulted in the deaths of at least 40,000 Polish civilians in Volhynia (in March 1944 another 10,000 in Galicia), causing additional 200,000 Poles to flee west before September 1944, and 800,000 after that. I forbid the use of the methods utilized by the Ukrainian butchers. We will not burn Ukrainian homesteads nor kill Ukrainian women and children in retaliation. The self-defence network must protect itself from the aggressors or attack the agressors but leave the peaceful population and their possessions alone. The AK on 20 July 1943 called upon Polish self-defense units to place themselves under its command. Ten days later, it declared itself in favor of Ukrainian independence on territories without Polish populations, and called for an end to the killings of civilians. Polish self-defense organizations took part in revenge massacres of Ukrainian civilians starting in the summer of 1943, when Ukrainian villagers who had nothing to do with the massacres suffered at the hands of Polish partisan forces. Evidence includes a letter dated 26 August 1943 to local Polish self-defense where AK commander Kazimierz Bąbiński criticized the burning of neighboring Ukrainian villages, killing any Ukrainian that crosses their path, and robbing Ukrainians of their material possessions. The total number of Ukrainian civilians murdered in Volyn in retaliatory acts by Poles is estimated at 2,000–3,000. The 27th Home Army Infantry Division was formed in January 1944, and tasked to fight the UPA and then the Wehrmacht. While Germans actively encouraged the conflict, for most of the time they tried not to get directly involved. Special German units formed from collaborationist Ukrainian and later Polish auxiliary police were deployed in pacification actions in Volhynia, and some of their crimes were attributed to either the Polish Home Army or the Ukrainian UPA. The Soviet and Nazi invasions of pre-war eastern Poland, UPA massacres, and postwar Soviet expulsions of Poles all contributed to the virtual elimination of a Polish presence in the region. Those who remained left Volhynia mostly for the neighbouring province of Lublin. After the war, the survivors moved further west to the territories of Lower Silesia. Polish orphans from Volhynia were kept in several orphanages, with the largest of them around Kraków. Several former Polish villages in Volhynia and Eastern Galicia do not exist any more and those that remain are in ruins. The Institute of National Remembrance estimates that 100,000 Poles were killed by the Ukrainian nationalists (40,000–60,000 victims in Volhynia, 30,000−40,000 in Eastern Galicia, and at least 4,000 in Lesser Poland, including up to 2,000 in the Chełm region). For Eastern Galicia, other estimates range between 20,000–25,000, 25,000 and 30,000–40,000. Niall Ferguson estimated the total number of Polish victims in Volhynia and Eastern Galicia to be between 60,000 and 80,000, G. Rossolinski-Liebe: 70,000–100,000, John P. Himka: 100,000. According to Motyka, from 1943 to 1945 in all territories that were covered by the conflict, approximately 100,000 Poles were killed. According to Ivan Katchanovski, a Ukrainian historian, between 35,000-60,000; with "the lower bound of these estimates [35,000] is more reliable than higher estimates which are based on an assumption that the Polish population in the region was several times less likely to perish as a result of Nazi genocidal policies compared to other regions of Poland and compared to the Ukrainian population of Volhynia." Władysław Siemaszko and his daughter Ewa have documented 33,454 Polish victims, 18,208 of which are known by surname. (in July 2010 Ewa Siemaszko increased the accounts to 38,600 documented victims, 22,113 of which are known by surname). At the first ever joint Polish-Ukrainian conference in Podkowa Leśna organized on June 7–9, 1994, by Karta Centre and subsequent Polish-Ukrainian historian meetings, with almost 50 Polish and Ukrainian participants, an estimate of 50,000 Polish deaths in Volhynia was settled which they considered to be moderate. [self-published source?] According to the sociologist Piotrowski, UPA actions resulted in an estimated number of 68,700 deaths in Wołyń Voivodeship. Per Anders Rudling states that the UPA killed 40,000–70,000 Poles in this area. Some extreme estimates place the number of Polish victims as high as 300,000. [verification needed] Also, the numbers include polonized Armenians killed in the massacres, e.g. in Kuty. The study from 2011 quote 91 200 confirmed deaths, 43 987 of which are known by name. Historian Timothy Snyder considers it likely that the UPA killed as many Ukrainians as it did Poles, as local Ukrainians who did not adhere to OUN's form of nationalism were regarded as traitors. Within a month of the beginning of the massacres, Polish self-defense units responded in kind; all conflicts resulted in Poles taking revenge on Ukrainian civilians. According to Motyka, the number of Ukrainian victims is between 2,000–3,000 in Volhynia and between 10,000–15,000 in all territories covered by the conflict. G. Rossolinski-Liebe puts the number of Ukrainians (both OUN-UPA members and civilians) killed by Poles during and after the World War at 10,000–20,000. Ukrainian casualties caused by Polish retributions are estimated at 2,000–3,000 in Volhynia. Together with those killed in other areas, the number of Ukrainian casualties were between 10,000 and 12,000, with the bulk of them occurring in Eastern Galicia and present-day Poland. According to Kataryna Wolczuk for all areas affected by conflict, the Ukrainian casualties are estimated as from 10,000 to 30,000 between 1943 and 1947. According to Motyka, author of a fundamental monograph about the UPA, estimations of 30,000 Ukrainian casualties are unsupported. Timothy Snyder 40-60k in '43 25k – 5k The Reconstruction of Nations, 2004 5k is Lublin and Rzeszów; "killed by the UPA"; "limited the death toll of Polish civilians to about twenty-five thousand in Galicia"
Timothy Snyder 5–10k – – –  "Polish preparations and Ukrainian warnings limited the deaths to perhaps 5,000-10,000"
Grzegorz Hryciuk – 20–24 – – Straty ludnosci w Galicji Wschodniej w latach 1941–1945 / G. Hryciuk // Polska–Ukraina: trudne pytania. – Warszawa, 2000. – T. 6. – S. 279, 290, 294. Cited by Kalischuk; from 43–46; 8820 in '43-mid'44; "according to relevant contemporary Polish sources"
P.R. Magocsi – – – 50k Magocsi; A History of Ukraine, p 681 "among the more reasonable estimates"
Marek Jasiak – – – 60-70k Redrawing Nations, p174 "In Podole, Volhynia, and Lublin"
Karta 35k 29.8k – – 6.5k "Polska-Ukraina", t.7, 2000, p. 159, cited by Kalishchuk: here  Karta based mostly on: Siemaszko for Volhynia (documented number) and Cz.Blicharski for Tarnopol voivodsh. Common communicate of PL and UKR historians 50-60k 20-25k – 5-6k "Polska-Ukraina: trudne pytania", 2000, t. 9, p. 403. "Polish casualties acc. to Polish sources"
IPN 60-80k – – – Oddziałowa Komisja w Lublinie, January 2012 killed by Ukrainian nationalists, 1939–1945? Pertti Ahonen et al. - - 100,000 Pertti Ahonen, Gustavo Corni, Jerzy Kochanowski, Rainer Schulze, Tamás Stark, Barbara Stelzl-Marx, People on the Move: Population Transfers and Ethnic Cleansing Policies During World War II and Its Aftermath. Berg Publishers. 2008. p. 99. "100,000 killed & 300,000 refugees in ethnic cleansing conducted by Ukrainian nationalists"
George Liber 25–70k 20–70k 50–100k – Total Wars and the Making of Modern Ukraine, 1914-1954 1943-44, "between 50,000 and 100,000 Poles"
Grzegorz Motyka 2-3k 1-2k - 10/11-15k 8-10k Od rzezi wołyńskiej do akcji "Wisła", 2011, page 448 1943–1947; According to Motyka, numbers of Ukrainian casualties from hands of Poles >= 30k are "simply pulled out of thin air". P.A. Rudling 20k – 11k in "Historical Representation of the Wartime Accounts of the Activities of the OUN..." citation: "Most mainstream estimates" "growing consensus, is [...] up to 20,000 Ukrainians killed by AK in Volhynia." P. R. Magocsi – – 20k Magocsi; A History of Ukraine, p 681 "among the more reasonable estimates"
T. Snyder 10k – – Past and Present "Over the course of 1943, perhabs ten thousand Ukrainian civilians were killed by Polish self-defence units, Soviet partisans, Nazi policemen". Rossolinski-Liebe - – 10-20k Celebrating Fascism... both UPA members and civilians, during and after the war. Rossolinski cites Motyka's estimation of 2006. Katarina Wolczuk – - 15-30k UK scholar. Cited by Marples. Katrina Witt – – 15-30k Ukrainian Memory and Victimhood, p101 Cited Marples, who cites Wolczuk. Zashkilniak L. and M. Krykun – – 35k Zashkilniak L., M. Krykun History of Poland: from ancient times to the present day / L. Over- Shkilnyak – Lviv, 2002. – p. 527 Cited by Kalishchuk. Anna M. Cienciala - - - 20k - The Rebirth of Poland. University of Kansas, lecture notes by professor Anna M. Cienciala, 2004 ...the Poles killed some 20,000 Ukrainians, mostly in former East Galicia in reprisal. George Liber 2–20k 1–4k 8–20k – Total Wars and the Making of Modern Ukraine, 1914-1954 1943-44, "and 8,000 to 20,000 Ukrainians died"
The decision to ethnically cleanse the area East of the Bug River was taken by the Ukrainian Insurgent Army early in 1943. In March 1943, OUN(B) (specifically Mykola Lebed) imposed a collective death sentence of all Poles living in the former eastern part of the Second Polish Republic and a few months later local units of the UPA were instructed to complete the operation with haste. The decision to cleanse the territory of its Polish population determined the course of future events. According to Timothy Snyder, ethnic cleansing of Poles was exclusively the work of the extreme Bandera faction of the Organization of Ukrainian Nationalists, rather than the Melnyk faction of that organization or other Ukrainian political or religious organizations. Polish investigators claim that the OUN-B central leadership decided in February 1943 to drive all Poles out of Volhynia, to obtain an "ethnically pure territory" in the postwar period. Among those who were behind the decision, Polish investigators singled out Dmytro Klyachkivsky, Vasyl Ivakhov, Ivan Lytvynchuk, and Petro Oliynyk. the decision to exterminate the Poles came directly from the OUN-UPA headquarters. the decision to exterminate the Poles can be attributed to some of the leaders of the OUN-UPA in the course of an internal conflict within the organisation. The question of whether this event should be characterized as 'genocide' or 'ethnic cleansing' is debated. Historian Per Anders Rudling states that the goal of the OUN-UPA was not to exterminate all Poles, but rather to ethnically cleanse the region in order to attain an ethnically homogeneous state." The goal was thus to prevent a repeat of 1918-20 when Poland crushed Ukrainian independence as the Polish Home Army was attempting to restore the Polish Republic within its pre-1939 borders. According to Ivan Katchanovski, the mass killings of Poles in Volhynia by the UPA cannot be classified as a genocide because there isn't evidence that the UPA intended to annihilate entire or significant parts of the Polish nation, the UPA action was mostly limited to a relatively small area and the number of Poles killed constituted quite a small fraction of the prewar Polish population on territories where the UPA operated and of the entire Polish population in Poland and Ukraine. The Volhynian massacres have all the traits of genocide listed in the 1948 UN Convention on the Prevention and Punishment of the Crime of Genocide, which defines genocide as an act "committed with intent to destroy, in whole or in part, a national, ethnical, racial or religious group, as such." On 15 July 2009 the Sejm of the Republic of Poland unanimously adopted a resolution regarding "the tragic fate of Poles in Eastern Borderlands". The text of the resolution states that July 2009 marks the 66th anniversary "of the beginning of anti-Polish actions by the Organization of Ukrainian nationalists and the Ukrainian Insurgent Army on Polish Eastern territories – mass murders characterised by ethnic cleansing with marks of genocide." On 22 July 2016, the Sejm passed a resolution declaring 11 July a National Day of Remembrance to honor the Polish victims murdered in Volhynia and Eastern Galicia by Ukrainian nationalists, formally calling the massacres a genocide. The events of the Massacre of Poles in Volhynia are depicted in the 2016 movie Volhynia, directed by the Polish screenwriter and film director Wojciech Smarzowski. ^ a b Massacre, Volhynia. "What were the Volhynian Massacres?". Volhynia Massacre. Retrieved 2018-03-10. ^ Motyka, Grzegorz (2006). Ukraińska partyzantka 1942–1960. Warsaw: Oficyna Wydawnicza „Rytm”. p. 413. ISBN 83-88490-58-3. ^ Motyka, Grzegorz (2016). Wołyń'43 Ludobójcza czystka- fakty, analogie, polityka historyczna. Cracow: Wydawnictwo Literackie. pp. 85, 124. ISBN 978-83-08-06207-4. ^ a b c d Timothy Snyder. "A Fascist Hero in Democratic Kiev". The New York Review of Books. NYR Daily. Bandera aimed to make of Ukraine a one-party fascist dictatorship without national minorities... UPA partisans murdered tens of thousands of Poles, most of them women and children. Some Jews who had taken shelter with Polish families were also killed. ^ Filip Mazurczak (13 July 2016). "The Volhynia Genocide and Polish-Ukrainian Reconciliation". Visegrad Insight. UPA's methods were sadistic. ^ Siemaszko, Ewa. The July 1943 genocidal operations of OUN-UPA in Volhynia (PDF). pp. 2–3. Archived from the original (PDF) on 2016-04-01. The Polish underground document provides a condensed account of this terrible savagery. ^ a b c Massacre, Volhynia. "The Effects of the Volhynian Massacres". Volhynia Massacre. Retrieved 2018-03-10. ^ a b ""Od rzezi wołyńskiej do akcji Wisła. Konflikt polsko-ukraiński 1943-1947"". dzieje.pl (in Polish). Retrieved 2018-03-10. ^ Ahonen, Pertti (2008). Peoples on the Move: Population Transfers and Ethnic Cleansing Policies During World War II and Its Aftermath. Bloomsbury Academic. p. 99. ^ "The Witnesses". Special issue. Institute of National Remembrance. The participation of the Ukrainian clergy was significant. In many localities Orthodox priests consecrated the murder tools. ^ Michał Klimecki (2013). "Combat involvement of Poland's 27th Infantry Division of the Volhynia Home Army against the UPA" (PDF). Institute of National Remembrance. 5 / 8 in PDF. Archived from the original (PDF) on 2016-08-12. Polish forces engaged the Ukrainian Insurgent Army in a series of offensive combat actions. One of the first such confrontations was on January 10–15, 1944. ^ Snyder 2003, p. 175. ^ Burds, Jeffrey (1999). "Comments on Timothy Snyder's article, "To Resolve the Ukrainian Question once and for All: The Ethnic Cleansing of Ukrainians in Poland, 1943–1947"". 1 (2). Journal of Cold War Studies. (1) Chronology. The more I study Galicia, the more I come to the conclusion that *the defining issue was not Soviet or German occupation and war, but rather the civil war between ethnic Ukrainians and ethnic Poles. ^ Piotr Zając, "Prześladowania ludności narodowości polskiej na terenie Wołynia w latach 1939–1945 – ocena karnoprawna zdarzeń w oparciu o ustalenia śledztwa OKŚZpNP w Lublinie" [in:] Zbrodnie przeszłości. Opracowania i materiały prokuratorów IPN, t. 2: Ludobójstwo, red. Radosław Ignatiew, Antoni Kura, Warszawa 2008, p.34-49. Quote="W świetle przedstawionych wyżej ustaleń nie ulega wątpliwości, że zbrodnie, których dopuszczono się wobec ludności narodowości polskiej, noszą charakter niepodlegających przedawnieniu zbrodni ludobójstwa." ^ PolskieRadio.pl (2 June 2013), Prezes IPN: zbrodnia na Wolyniu to ludobojstwo. ^ Rudling, Per A. (November 2011). "The OUN, the UPA and the Holocaust: A Study in the Manufacturing of Historical Myths". Number 2107. University of Pittsburgh: The Carl Beck Papers in Russian & East European Studies. p. 3 (6 of 76 in PDF). ISSN 0889-275X. ^ a b c Subtelny, Orest (2000). Ukraine, A History. University of Toronto Press. p. 430. ^ The police also reported wounding 20 communists in 1935, and in one case wounded at least seven people while being attacked by a large group armed with sickles and clubs. The communists retaliated against those who failed to participate in strikes. From: Timothy Snyder (2007). Sketches from a Secret War: A Polish Artist's Mission to Liberate Soviet Ukraine. Yale University Press. pp. 137, 142. ^ Subtelny, Orest. (1988). Ukraine: A History. Toronto: University of Toronto Press, pg. 432. ^ Lidia Głowacka, Andrzej Czesław Żak, Osadnictwo wojskowe na Wolyniu w latach 1921–1939 w swietle dokumentów centralnego archiwum wojskowego Archived 2014-08-15 at the Wayback Machine (Military Settlers in Volhynia in the years 1921–1939), PDF, pp. 143 (4 / 25 in PDF), 153 (14 / 25 in PDF). "Mimo ogromnych trudności, kryzysu gospodarczego na początku lat 30. i złożonej sytuacji politycznej na tym terenie, osadnicy zdołali zagospodarować znaczne obszary ziemi i stworzyć od podstaw wiele osad z nowoczesną –jak na owe czasy –infrastrukturą. W 1939 r. na Wołyniu mieszkało około 17,7 tys. osadników wojskowych i cywilnych w ponad 3,500 osad." ^ a b c d e f A. Rudling. Theory and Practice. Historical representation of the wartime accounts of the activities of OUN-UPA (Organization of Ukrainian Nationalists-Ukrainian Insurgent Army). East European Jewish Affairs. Vol. 36. No.2. December 2006. pp. 163–179. ^ The assassinations of foreign affairs minister Bronisław Pieracki or of a supporter of peaceful Polish-Ukrainian cooperation, Tadeusz Hołówko, are two examples of OUN-B terrorist campaign. ^ In one of many such incidents, the Papal Nuncio in Warsaw reported that Polish mobs attacked Ukrainian students in their dormitory under the eyes of Polish police, a screaming Ukrainian woman was thrown into a burning Ukrainian store by Polish mobs, and a Ukrainian seminary was destroyed during which religious icons were desecrated and eight people were hospitalized with serious injuries and two killed. See Burds 1999. ^ a b Burds 1999. ^ Snyder 2003, p. 144. ^ Orest Subtelny. (1988). Ukraine: A History. Toronto: University of Toronto Press. pp.444. ^ a b c d e f g h i Snyder 2001. ^ Oleksandr Zinchenko (2 December 2010). "Година папуги" майора Людвіка Домоня ["The hour of the parrot" Major Ludwig Domont]. istpravda.com.ua (in Ukrainian). Retrieved 8 April 2015. ^ a b c d e f Matthew J. Gibney, Randall Hansen, Immigration and Asylum, page 204. Books.google.com. Retrieved on 11 July 2011. ^ Orest Subtelny. (1988). Ukraine: A History. Toronto: University of Toronto Press, pp. 455–457. ^ Matthew J. Gibney, Randall Hansen.Immigration and Asylum: From 1900 to the Present. ABC-CLIO. 2005. p. 205. ^ Ivan Katchanovski. The Politics of World War II in Contemporary Ukraine 2013. p. 17. ^ Dr. Frank Grelka (2005). Ukrainischen Miliz. Die ukrainische Nationalbewegung unter deutscher Besatzungsherrschaft 1918 und 1941/42. Viadrina European University: Otto Harrassowitz Verlag. pp. 283–284. ISBN 3447052597. Retrieved 17 July 2015. ^ Snyder 2003, p. 163. ^ Snyder 2003, p. 162. ^ Snyder 2003, pp. 165,166,168. ^ Wilson, A. (2000). The Ukrainians: Unexpected Nation. New Haven: Yale University Press. ^ The theory and teachings of the Ukrainian nationalists were very close to Fascism, and in some respects such as the insistence on 'racial purity', even went beyond the original fascist doctrines. John A. Armstrong. Ukrainian nationalism (1980). Ukrainian Academic Press. p. 280. ^ Bohdan Budurowycz. (1989). Sheptytski and the Ukrainian National Movement after 1914 (chapter). In Paul Robert Magocsi (ed.). Morality and Reality: The Life and Times of Andrei Sheptytsky. Edmonton, Alberta: Canadian Institute of Ukrainian Studies, University of Alberta. pg. 57. ^ a b Snyder 2003, pp. 164-5. ^ Taras Bulba-Borovets wrote: The axe and the flail have gone into motion. Whole families are butchered and hanged, and Polish settlements are set on fire. The 'hatchet men', to their shame, butcher and hang defenseless women and children....By such work Ukrainians not only do a favor for the SD [German security service], but also present themselves in the eyes of the world as barbarians. We must take into account that England will surely win this war, and it will treat these 'hatchet men' and lynchers and incendiaries as agents in the service of Hitlerite cannibalism, not as honest fighters for their freedom, not as state-builders. John Paul Himka. Ukrainian past and future. September 20, 2010, Retrieved January 19, 2013. ^ a b c d e Snyder 2003, p. 168. ^ a b Ray Brandon, Wendy Lower (2008). The Shoah in Ukraine: History, Testimony, Memorialization. Indiana University Press. p. 102. ISBN 9780253001597. ^ Snyder 2003, p. 169. ^ Tadeusz Piotrowski: Genocide and Rescue in Wolyn: Recollections of the Ukrainian Nationalist Ethnic Cleansing Campaign Against the Poles During World War II, McFarland & Company, 2000, ISBN 0-7864-0773-5. ^ Wołyń – Janowa Dolina. Wolyn.ovh.org. Retrieved on 11 July 2011. ^ Katarzyna Skrzydłowska-Kalukin (19 June 2016). "It is a miracle that I am alive". Wprost. Archived from the original on 17 July 2016. ^ a b Snyder 2003, pp. 172-3. ^ a b c d www.lwow.home.pl. www.lwow.home.pl. Retrieved on 11 July 2011. ^ Foreign Policy Association: Central and Eastern Europe|CE Europe. Fpa.org. Retrieved on 11 July 2011. ^ Antypolskie akcje nacjonalistów ukraińskich. Lwow.home.pl. Retrieved on 11 July 2011. ^ Snyder 2003, p. 176. ^ Norman Davies – Teksty – EUROPA. Davies.pl. Retrieved on 11 July 2011. ^ History of Buczacz during World War II quoted from Norman Davies (1996), Europe: A History. Shtetlinks.jewishgen.org. Retrieved on 11 July 2011. ^ (in Polish) Po Polakach pozostały mogiły… – Rzeczpospolita. Rp.pl. Retrieved on 11 July 2011. ^ a b (in Polish)Bogusława Marcinkowska, Institute of National Remembrance, Ustalenia wynikające ze śledztwa w sprawie zbrodni ludobójstwa funkcjonariuszy SS "GALIZIEN" i nacjonalistów ukraińskich na Polakach w Hucie Pieniackiej 28 lutego 1944 roku. ^ Mieczyslaw Juchniewicz, ‘’Polacy w. radzieckim ruchu podziemnym I partyzanckim 1941–1945. Warsaw: Ministerstwo Obrony Narodowej. Cited in Michael Logusz (1997). Galicia Division: The Waffen-SS14th grenadier Division 1943–1945. Pennsylvania: Schiffer Publishing. ISBN 0-7643-0081-4 pg. 459. ^ Ukrainian State Archives Archived 2017-08-10 at the Wayback Machine. Archives.gov.ua. Retrieved on 11 July 2011. ^ Pure Soldiers Or Sinister Legion: The Ukrainian 14th Waffen-SS Division – Sol Littman – Google Books. Books.google.com. Retrieved 8 April 2015. ^ Snyder 2003, p. 166. ^ Snyder 2003, p. 196. ^ a b Grzegorz Motyka, Od rzezi wołyńskiej do akcji "Wisła". Konflikt polsko-ukraiński 1943– 1947. Kraków 2011, p.447. See also: Book review by Tomasz Stańczyk: "Grzegorz Motyka oblicza, że w latach 1943–1947 z polskich rąk zginęło 11–15 tys. Ukraińców. Polskie straty to 76–106 tys. zamordowanych, w znakomitej większości podczas rzezi wołyńskiej i galicyjskiej." ^ Wiktoria Śliwowska, Jakub Gutenbaum, The Last Eyewitnesses, page 187. Books.google.com (13 May 1998). Retrieved on 11 July 2011. ^ Tluste/Tovste, Ukraine – Czerwonogrod. Tovste.info (3 February 1945). Retrieved on 11 July 2011. ^ (in Polish) Zagłada Puźnik – Rzeczpospolita. Rp.pl. Retrieved on 11 July 2011. ^ Filar 1999, pp. 71–2. ^ Niall Ferguson, The War of the World, Penguin Press, New York, 2006, page 455. ^ Gazeta Wyborcza 23.04.2003. Ji-magazine.lviv.ua. Retrieved on 11 July 2011. ^ Na rubieży (2007). "Ogólnopolskie seminarium historii kresów wschodnich II Rzeczypospolitej polskiej". Issues 89–94. Stowarzyszenie Upamie̜tnienia Ofiar Zbrodni Ukraińskich Nacjonalistow: 20–21, 40–44. ISBN 8373993762. OCLC 183409524. ^ In February 1945, in the village of Zalesie, Buczacz County, a Ukrainian man was tortured to death by members of the Bandera for refusing to kill his Polish mother—see Komański et al. 1995, p. 25. ^ I. Ilyushin. "Бойові дії ОУН і УПА на антілольському фронті" [OUN and UPA on the anti-Polish front] (PDF). Chapter 5. Kiev: Institute of History of the Ukrainian Academy of Sciences. p. 241. Archived from the original (PDF) on 2008-12-19. ^ a b Müller, Jan-Werner (2002-08-29). Memory and Power in Post-War Europe: Studies in the Presence of the Past. Cambridge University Press. ISBN 9780521000703. ^ Institute of Ukrainian History, Academy of Sciences of Ukraine, Organization of Ukrainian Nationalists and the Ukrainian Insurgent Army, Chapter 5, p. 264 Written by Ihor Ilyushin. ^ a b Snyder 2003, pp. 173-4. ^ Grzegorz Motyka (2008-05-24). "Zapomnijcie o Giedroyciu: Polacy, Ukraińcy, IPN" [Forget about Giedroyc: Poles, Ukrainians and the IPN]. Wyborcza, Archiwum. Archived from the original on 2008-09-21 – via Internet Archive. W sumie w latach 1943-47 zginęło 80-100 tys. Polaków oraz 10-20 tys. Ukraińców. Na Wołyniu relacja jest wprost porażająca - po polskiej stronie było może nawet 50-60 tys. ofiar, po ukraińskiej - raczej nie więcej niż 2-3 tys. ^ Timothy Snyder, The causes of Polish and Ukrainian Ethnic Cleansing, Past&Present, A Journal of Historical Studies, nr 179, 2003, pg. 223. ^ Prof. Władysław Filar, Polish Institute of National Remembrance, "Antypolskie akcje nacjonalistów ukraińskich"
^ a b c Katchanovski, Ph.D., Ivan. "Terrorists or National Heroes? Politics of the OUN and the UPA in Ukraine". Davis Center for Russian and Eurasian Studies, Harvard University: 7. ^ Niall Ferguson, The War of the World, Penguin Press, New York 2006, page 455. ^ a b G. Rossolinski-Liebe. Celebrating Fascism and War Criminality in Edmonton. The Political Myth and Cult of Stepan Bandera in Multicultural Canada. Kakanien Revisited. 29 December 2010. ^ Motyka, Grzegorz (2016). Wołyń'43 Ludobójcza czystka - fakty, analogie, polityka historyczna. Cracow: Wydawnictwo Literackie. p. 83. ISBN 978-83-08-06207-4. ^ Władysław Siemaszko, Ewa Siemaszko, Ludobójstwo dokonane przez nacjonalistów ukraińskich na ludności polskiej Wołynia 1939–1945, Warsaw 2000, p. 1050. ^ Biuletyn Instytutu Pamięci Narodowej nr 7-8/2010 (116–117), July–August 2010; KOMENTARZE HISTORYCZNE: Ewa Siemaszko, "Bilans zbrodni." (PDF – 1,14 MB). ^ Polish-Ukraine: A Difficult Answer. Documentation on the Meetings of Historians (1994–2001), Chronicle of Events in Volhynia and Eastern Galicia (1939–1945). Warsaw: Head Office of State Archives (NDAP) and the KARTA Centre. 2003. ISBN 83-89115-36-0. ^ Kataryna Wolczuk, "The Difficulties of Polish-Ukrainian Historical Reconciliation," Royal Institute of International Affairs, London, 2002. ^ Timothy Snyder (2002). Jan-Werner Müller, ed. Memory and Power. Poland, Lithuania and Ukraine. Cambridge University Press. p. 43. ISBN 052100070X. ^ a b Alexander Gogun (2005). "Деятельность вооружённых националистических формирований на террито-рии западных областей УССР (1943–1949)". Lib.OUN-UPA.org.ua. Archived from the original on 2013-03-21. See also: Grzegorz Rossoliński-Liebe (15 August 2011). "Article co-authored by Alexander Gogun, posted on the nationalist website 'OUN-UPA', obfuscates the Ukrainian Holocaust, denying OUN and UPA anti-Jewish Violence". University of Hamburg: Web journal 'Defending History' Vol. VII, No. 2458. ^ Vic Satzevich, The Ukrainian Diaspora. Books.google.com. Retrieved on 11 July 2011. ^ Viktor Polishchuk ''Gorkaya Pravda. Prestuplenya OUN-UPA.'' (in Russian). Sevdig.sevastopol.ws. Retrieved on 11 July 2011. ^ "Its main goal was to [...] remove – by force, if necessary – non-Ukrainians from the social and economic spheres of a future Ukrainian state." & Simultaneously, steps were undertaken to eliminate "foreign elements" in Ukraine. OUN-B posters and leaflets incited the Ukrainian population to murder Poles and "Judeo-Muscovites". (...) the Third Conference of the OUN-B finalized its plans. [in:] Matthew J. Gibney, Randall Hansen, Immigration and Asylum, page 204-205. Books.google.com. Retrieved on 11 July 2011. ^ Timothy Snyder (2010). Bloodlands: Europe between Hitler and Stalin. Basic Books. p. 500. Documentation of UPA's plans for and actions toward Poles can be found in TsDAVO 3833/1/86/6a; 3833/1/131/13-14; 3833/1/86/19-20; and 3933/3/1/60. Of related interest are DAR 30/1/16=USMM RG-31.017M-1; DAR 301/1/5-USHMM RG-31/017M-1; and DAR 30/1/4=USHMM RG-31.017M-1. These OUN-B and UPA wartime declarations coincide with post-war interrogations (see GARF. R-9478/1/398) and recollections of Polish survivors (on the massacre of 12–13 July 1943, for example see OKAW, II/737, II/1144, II/2099, II/2650, II/953, and II/755) and Jewish survivors (for example ŻIH 301/2519, and Adini, Dubno:sefer zikarom, 717–118). ^ Volhynia: The Reckoning Begins. Tol.cz. Retrieved on 11 July 2011. ^ RFE/RL Newsline, 03–02–13. Hri.org. Retrieved on 11 July 2011. ^ World Briefing | Europe: Ukraine: Joint Memorial To Massacre. New York Times (12 July 2003). Retrieved on 11 July 2011. ^ RFE/RL Newsline, 03–07–14. Hri.org. Retrieved on 11 July 2011. ^ "Zdemontowano pomnik UPA w Hruszowicach. Ukraina protestuje". TVN24.pl. Retrieved 2018-07-13. Filar, Władysław, ed. (1999). Ekusterminacja łudnosci polskiej na Wołyniu w drugiej wojnie światowej [The Extermination of the Polish Population of Volhynia During World War II] (in Polish). Warsaw. Ilyushin, Ihor (2009). UPA i AK. Konflikt w Zachodniej Ukrainie (1939–1945) (in Polish). Warszawa: Związek Ukraińców w Polsce. ISBN 978-83-928483-0-1. Komański, H.; Buczkowski, Ludwik; Skiba, Jan; et al., eds. (1995). "Zbrodnie banderowskich bojówek OUN-UPA w pow. Buczacz, woj. tarnopolskie" [Crimes Committed by the Bandera OUN-UPA Fighting Squads in Buczacz County of Tarnopol Province]. Na Rubieży [On the Frontier] (in Polish). 4 (14). (in Ukrainian) L.Melnik, B.Yurochko, "Rozkhytane derevo myfiv" in The Lviv Newspaper, May 25, 2007. Grzegorz Motyka (2006). Ukraińska partyzantka 1942–1960 (in Polish). Warsaw: RYTM. ISBN 83-7399-163-8. Niedzielko, Romuald (2009). "Sprawiedliwi Ukraińcy. Na ratunek polskim sąsiadom skazanym na zagładę przez OUN-UPA". Biuletyn IPN, 1-2/2009 (in Polish). IPN. pp. 77–85. Archived from the original on 2010-04-30. Retrieved 23 August 2009. Filip Ożarowski Wolyn Aflame, Publishing House WICI, 1977, ISBN 0-9655488-1-3. Tadeusz Piotrowski: Genocide and Rescue in Wolyn: Recollections of the Ukrainian Nationalist Ethnic Cleansing Campaign Against the Poles During World War II, McFarland & Company, 2000, ISBN 0-7864-0773-5. Władysław Siemaszko, Ewa Siemaszko (2000). Ludobójstwo dokonane przez nacjonalistów ukraińskich na ludności polskiej Wołynia 1939–1945 (in Polish). Warszawa. ISBN 83-87689-34-3. Snyder, Timothy (2001). To Resolve the Ukrainian Question Once and For All: The Ethnic Cleansing of Ukrainians in Poland, 1943–1947 (PDF). Working Paper #9. Yale University. Snyder, Timothy (2003). The Reconstruction of Nations. Poland, Ukraine, Lithuania, Belarus, 1569–1999. Yale University Press. ISBN 0-300-10586-X. Andrzej L. Sowa (1998). Stosunki polsko-ukraińskie 1939–1947 (in Polish). Kraków. OCLC 48053561. Subtelny, Orest (1988). Ukraine: A History. University of Toronto Press. ISBN 0-8020-5808-6. Mikolaj Teres: Ethnic Cleansing of Poles in Volhynia and Eastern Galicia, Alliance of the Polish Eastern Provinces, 1993, ISBN 0-9698020-0-5. Marcin Wojciechowski, ed. (2008). Wołyń 1943–2008. Pojednanie (in Polish). Warszawa: Agora. ISBN 978-83-7552-195-5. Wikimedia Commons has media related to Volhynia massacres. Kost Bondarenko, "The Volyn Tragedy: Echoes Through Decades" in Zerkalo Nedeli (the Mirror Weekly), February 15–21, 2003. An abbreviated preface to the monographic book of Władysław Siemaszko and Ewa Siemaszko, November 2000.